“I know one thing: That I know nothing.” —Duh, it’s like, a famous quote. It takes Cher Horowitz (Alicia Silverstone) most of Clueless’ 97-minute runtime to reach the conclusion most viewers arrive at sometime within the film’s first 60 seconds: She is just totally clueless. Even if the word itself didn’t pop up on the screen in big, neon-pink-on-green lettering in the opening credits, Cher’s voiceover assertion that she has a “way-normal life for a teenage girl,” juxtaposed against images of Beverly Hills excess—lavish pool parties, hot new cars, computerized outfit-coordination systems—quickly expose her as a hilariously unreliable narrator. And yet the utmost confidence of Cher’s proclamations on life, love, and fashion lend her a sort of blowhard authority, the kind commonly associated with politicians and lawyers—even if what she says isn’t accurate, it sounds like it is. Her knowledge of the world outside the glossy, mirrored walls of her sheltered life is paper-thin, but it doesn’t matter; she can talk the talk (the 15-year-old version of it, anyway), so she doesn’t need to know what she’s talking about, whether it’s the existential value of Ren & Stimpy, or the topics she’s called upon to discuss during first-period debate class. Cher’s “debate” says absolutely nothing about her position on immigration reform, but it says everything about how she sees the world and her place in it: Any problem can be solved by a little effort and a lot of blind optimism. (The title writer-director Amy Heckerling originally had for the project, when she pitched it as a TV show, was even more apt than Clueless in this regard: No Worries.) Cher’s tiny universe is one of privilege so ingrained, she can’t even process it, one where the act of simply desiring something is enough to make it manifest. There’s no obstacle in Cher’s world that can’t be overcome through sheer force of will; it’ll work because she says it’ll work. Bad grades? That can be negotiated. Can’t parallel park? Don’t worry, everywhere you go has valet. Not 5-foot-10 like Cindy Crawford? Don’t drink that sucky Italian roast, you’ll get there. Cher knows best, even when she doesn’t. She’s a bimbo Buddha, completely at peace with her interpretation of life. Because of Clueless’ popularity with young girls, from its 1995 release to today, it’s possible for curmudgeons to interpret Cher, and the movie that celebrates her, as vacuous, superficial, and ultimately damaging to those who see the character as an aspirational figure. Clueless’ satirical touch is telegraphed right there in the title, but it’s so deft, it can be easy to miss among the loud, vulgar displays of narcissism and consumerism that compose the film’s aesthetic—particularly when that materialism is as heavily aped and marketed as Clueless’ was following the film’s release. (Hello, Clueless Barbie dolls.) But while it’s easy to roll our eyes at Cher’s lack of awareness, there’s something admirable about her confidence as she flaunts it. Cher and her “crew” can be exasperating in their entitlement, and they do have a certain “us vs. them” mentality regarding those not in their sphere of popularity—when Cher suggests Elton (Jeremy Sisto) “go with” the lower-class Tai, he’s horrified—but their insularity makes them mostly harmless; they’re primarily concerned with building themselves up, rarely with bringing others down. In addition to Heckerling’s desire to create a positive, happy character, this attitude can be partly attributed to the movie’s source material, the 1815 Jane Austen novel Emma: While matters of class and breeding figure into the characterization and plot, the social structure of Georgian-Regency England is so entrenched, people in the higher classes feel little threat from those below them, only occasional charity toward them. Whereas the more modern view of high-school popularity hierarchy, seen in Heathers and Mean Girls, is that it’s capricious and constantly at risk of being overturned by less-popular usurpers, who must be controlled and belittled by their social “betters” to maintain the status quo. 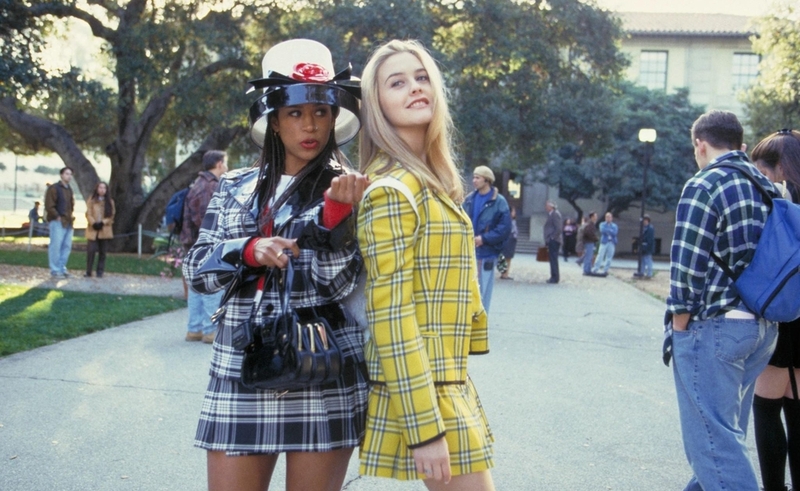 But there’s nothing overtly evil or antagonistic about Cher Horowitz—certainly nothing comparable to the actions of a Heather Chandler or Regina George—which makes her easy to like despite her blinkered view of the real world. Ultimately, getting the guy she wants isn’t Cher’s triumph. Realizing she’s been clueless about the fact that she wants him is her triumph, as signified by the explosion of light, color, and Celine Dion balladry that accompanies her moment of clarity in front of an erupting fountain. Cher and Josh getting together is Clueless’ denouement, not its climax. The climax, such as it is—Clueless’ episodic structure keeps it from having a climax in the traditional sense, but it is the emotional turning point—comes at that moment when Cher realizes she is totally clueless. It’s when she realizes she knows nothing, that definition of wisdom apocryphally attributed to Socrates. In that moment of growth, she becomes the person she’s been threatening to become the entire movie, one who realizes she doesn’t have all the answers, doesn’t know exactly how to get the boy she likes, and can’t talk her way into or out of any situation. Realizing she isn’t invincible is one of her first big steps into adulthood. It’s just a tiny one, though. The film doesn’t offer any reason to believe Cher is going to change that much. But even if she doesn’t get much further than being team captain of the Pismo Beach Disaster Relief effort, that’s still an important shift: Her interest in helping others, that boundless optimism she’s applied to every trifling, petty matter of high-school popularity, is being applied to something outside the narrow sphere of her own life. She believes donating unwanted red caviar and ski equipment is the best way to help, and that keeps the shift realistic; Cher is never going to be Mother Theresa, because she’ll most likely never be in a position to experience real suffering. But in the context of Cher’s life, and the context of Clueless as a whole, she’s doing something that matters. “Being a teenager is an important time of life,” Heckerling said in that EW interview. “It’s when you figure out who you are. And I don’t think that that’s less important than anything else.” What’s unsaid there is that Cher’s problems aren’t inherently dismissible just because they’re coming from a place of youth, privilege, and ignorance. Personal growth is personal growth, no matter the starting point. The important thing is being able to sympathize with the person doing the growing, and that’s where Clueless succeeds, against long odds. Cher’s problems aren’t on the level of the Haitians seeking refuge in America, or Pismo Beach residents who lost everything, but they matter to her. And that makes them matter to the audience watching her. Tomorrow, our look at Clueless continues with a staff forum on the film’s young cast, sharp dialogue, and enduring nostalgic value. Then on Thursday, Tasha Robinson looks at how the film’s like-way-1990s update of the Austen book is more faithful in its way than the much more literal film adaptation starring Gwyneth Paltrow, which was released the year after Clueless.